Welcome to the Crystal Hearts Official Site! 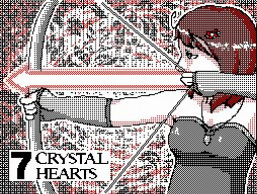 Enter a world of mystery, magic, and mayhem with Crystal Hearts, the latest comic to hit Flipnote Hatena! Based off of an unfinished novel written by Morgan (a.k.a. SuperAelita) herself, the first episode debuted on June 11, 2011. It was a smash hit with over 1,200 comments, 170,000 views, and 700,000 stars. Critically acclaimed as possibly becoming "the next Gravity", Morgan decided to continue the story she invented as a child and see where it would take her. Crystal Hearts is illustrated in a mostly black-and-white flip-manga style that must be read frame-by-frame. It is different from many popular Hatena series in the sense that it does not revolve around romance, etc., although Morgan has promised to incorporate some fluffier elements in the future. The goal of this series is to reach a diverse target audience, though Morgan has warned that the plot may become a bit creepy and is recommended for readers in grade six and up. It has been stressed that this is a story she created for the fun of it and is serving as a "practice run" to see what exactly can be achieved with a DSi. All-in-all, Crystal Hearts holds a great deal of promise and has attracted a lot of attention thus far. So kick back, relax, and stay a while at the official website for this excitingly unusual series.